Coaching is a great way to help people improve at work. Yet, many managers and project managers decline to use this approach. Why? It is widely assumed that coaching involves a major time commitment and extensive training. Further, many professionals are unsure how to use the approach. Fortunately, there is a solution to help you get better at coaching. 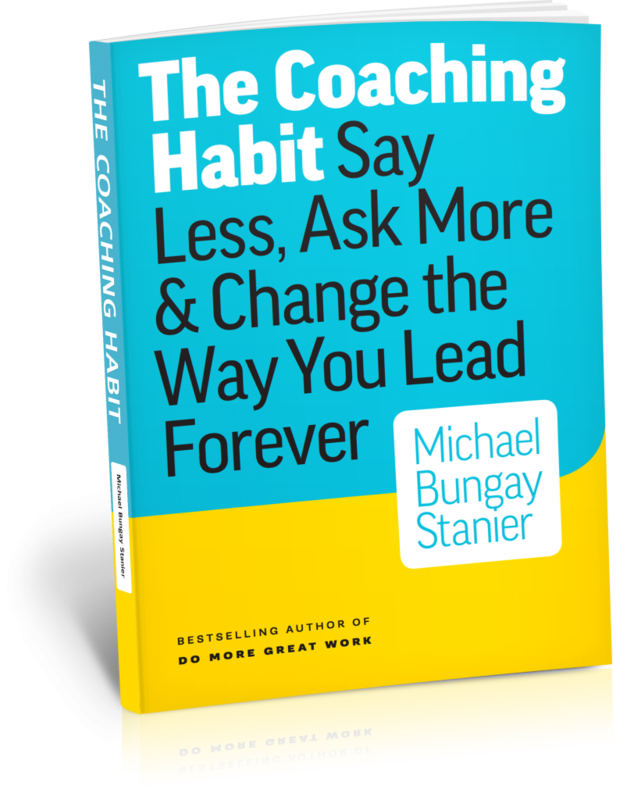 Michael Bungay Stanier has a new book, “The Coaching Habit: Say Less, Ask More & Change the Way Your Lead Forever,” that provides an easy to read and practical guide to getting started with coaching. Today’s discussion of the book is based on my reading and a discussion with the author. It was a treat to meet Bungay Stanier here in Toronto earlier this month. There is a growing profession dedicating to the art and science of coaching. In fact, it is a field that I have been studying myself. However, this is not an all or nothing approach. In a way, I think about “The Coaching Habit” like First Aid. You can deliver great benefits to someone in distress with First Aid training, no medical degree required. Of course, you need to know your limits and when to call in professional support. Bungay Stanier’s definition of coaching is simple and may be summarized as follows: “Ask more questions and give less advice.” The book lays out seven powerful questions that one can use to get started in coaching. While the book is aimed at managers with direct reports, one can apply the principles to other circumstances. Like any new skill or approach, be prepared for some discomfort as you learn the skills. There is a time and place for issuing orders and providing direct advice. Bungay Stanier makes the case to curtail that practice and give more time to engaging staff through questions. He proposes using a series of questions designed to foster creativity and better understand problems. Let’s consider a few ways that using questions helps managers understand their teams and business better. Question Assumptions. Previously, I’ve explained the value of standard operating procedures. Those are a key way to operate a business. Using coaching-style questions from time to time reminds us to question our perspective on how we operate. Understand Others Better. Using simple questions such as “what do you want?” – asked in the right way – make a difference. Bungay Stanier notes that asking the question several times is sometimes required to obtain a true understanding. Use Appreciative Inquiry As A Framework. The “AI” approach is a method to engage people in problem solving. Fortunately, there is no need to complete a full degree to use this tool. When managers encourage their staff to solve problems rather than simply providing a solution, you receive two benefits. First, you receive a solution to the problem. Second, the other person develops problem solving skill. Find And Leverage Positive Deviance. This concept is a novel and inspiring way to think about exceptional people and organizations. Bungay Stanier points out that there are pockets of innovation, top quality managers and other exceptional qualities in every organization. Once you find those units, studying their approach through questioning and other methods is often a great approach. Leveraging positive deviance also solves the “not invented here” problem. Adopt The Consultant’s Viewpoint. Management consultants contribute value through their methods, knowledge, fresh perspective and other means. In the recommended reading section of the book, Bungay Stanier recommends Peter Block’s modern business classic, Flawless Consulting. Typically, such books are read by current or aspiring consultants. Bungay Stanier’s recommendation points out that we can improve performance by adopting the consultant’s “outsider” perspective. Use the following scenarios to put the book’s coaching questions and practices into practice. I have experimented with some of the questions and have had good results so far. Whether you are the manager or the direct report, coaching questions are useful in this context. Sometimes, people simply need to be a bit of encouragement to share their views. It is easy to stay focused on “business as usual” habits and processes. Asking questions such as “what’s the challenge for you in this situation?” help us to move forward. The article I wrote on meetings – 7 Habits of Highly Effective Meetings – has become one of the most popular articles on this website. Developing skill at running business meetings (e.g. strategy meetings, problem solving meetings, risk workshops and so forth) becomes easier when you use coaching questions. Properly understanding a problem is important to developing a solution. The Coaching Habit questions encourage us to think more deeply. That means going beyond the first comment or problem to solve the underlying problem. For instance: an IT manager might use coaching habit questions to evaluate a security breach more deeply rather than taking a report at face value. Establishing new relationships is important whether you are in sales or work in an internal function. Bungay Stanier’s coaching questions are useful in getting to know what the other person needs. In the project management context, the coaching approach can be used to engage stakeholders and define requirements. I was fortunate to receive an advance copy of “The Coaching Habit” for review. If you would like to read the book and receive special bonus materials, order the book on Feb 29th. The book has already gathered up great endorsements from David Allen, Daniel Pink and Brené Brown. Claim Book Bonuses From The Box of Crayons Website: Visit THE COACHING HABIT BOOK website. The Guide to Effective Coaching in 10 Minutes. In this Youtube video presentation, Michael Bungay Stanier presents coaching and shares an easy to way to get started. The Four Hardest Questions to Answer at the End of the Year. In this article, Michael Bungay Stanier shares reflection questions to make sense of your year. Of course, you can use these questions at any time of the year. I think the “What do I need to kill off?” question is a powerful way to increase productivity. Thanks a lot for sharing this articule …I really appreciate your recommendations and comments about Coaching and this book. .